Want bold colors? Want sparkles? Want saturation & pigmentation? Look no further, Makeup Geek just released a new line of 10 professional-grade pigments that are so beautiful you won't believe your eyes! This product is a MUA's dream and is so amazing that it doesn't even need a review. The people behind MUG really know what they're doing and it truly shows in their makeup. Once again, I am obsessed and really excited to share this new discovery! 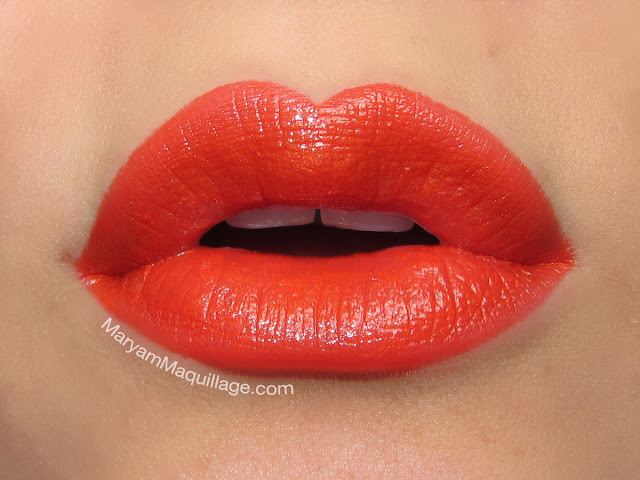 Red Apple Lipstick in Sunkissed -- gluten-free and allergen-free lipstick in a stunning, Golden-Orange summer color that perfects the complexion and beautifies any look! Red Apple was recently voted as the best gluten-free cosmetics brand by Delight Gluten-Free Magazine, so it's not only gorgeous, but also healthy! 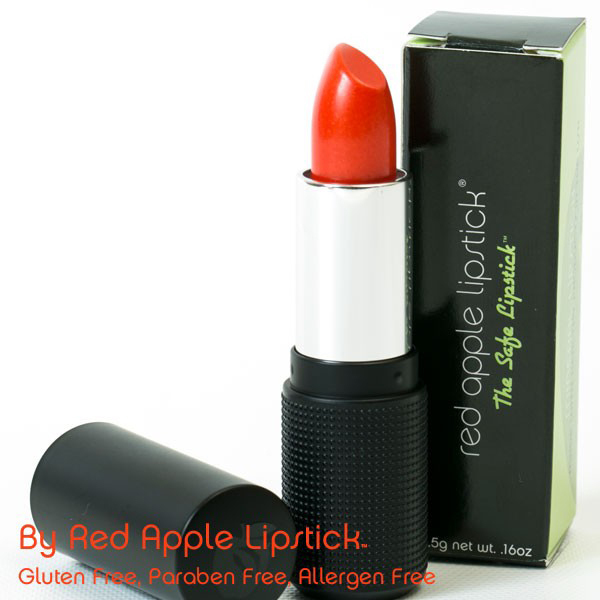 This lipstick is perfect for those of you with gluten intolerance or have certain allergies and is also paraben-free, soy / dairy-free, plus it's 100% vegan, natural and cruetly-free! The lipstick glides on smooth and truly perfects the texture of the lip tissue. Sunkissed lasts about 2-3 hours without touch ups, and fades to a pretty coral stain. This is my favorite shade in the collection and I totally recommend it! Prime the lid and allow a few seconds for the primer to set. Using an angled liner brush and a brown base (I used Makeup Geek gel liner in Mobster) trace your natural crease and extend the outer portion in a wing shape. Fill in the color above the line, a third of the way to the brow and blend out the upper edge. With a flat brush, apply a brown pigment (Makeup Geek pigment in Insomnia) directly on top of the base. Blend out the edge with a clean fluffy brush, then add a flesh tone pigment (MUG pigment Sweet Dreams) to the brow bone and to the inner portion of the crease to blend out the color further. Using a detailing brush, sharpen the outer portion of the cut-crease border using a dark brown shade (Makeup Geek e/s in Bada Bing). Bring this color to the lower lash line as well. 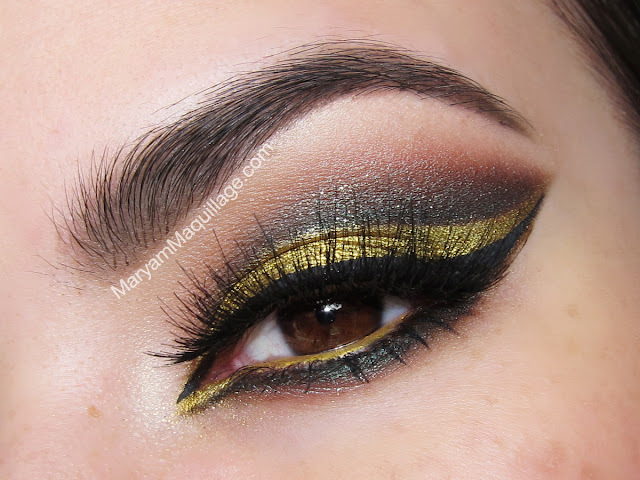 Use a lighter brown shade (MUG e/s in Taupe Notch) to sharpen the inner portion of the cut-crease. With a flat synthetic brush and a gold base or gel liner (I used Makeup Geek gel liner in Treasure), draw a line directly underneath following the same winged pattern. Fill in the entire lid and wing, then line the waterline and extend the inner corner wing with the same gold gel liner. Apply liquid gold pigment (MUG pigment Liquid Gold) on top of the base: lid, inner corner, outer wing, except for the waterline. Line underneath the inner corner wing with a brown gel liner (Mobster) and sharpen the entire lower lash line. 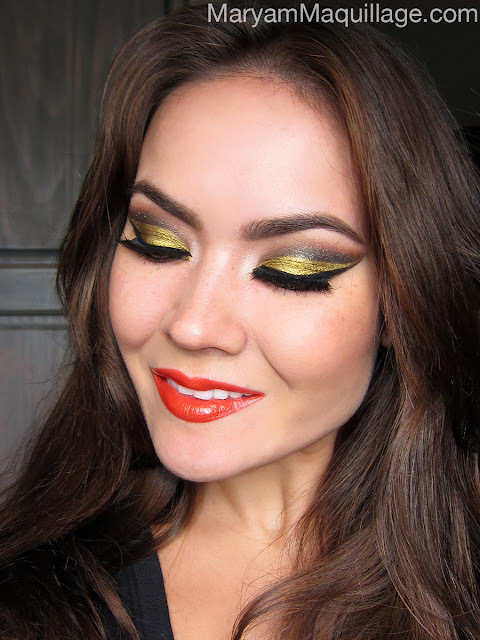 Add a sparkly highlight to the inner corner (MUG pigment New Year's Eve). 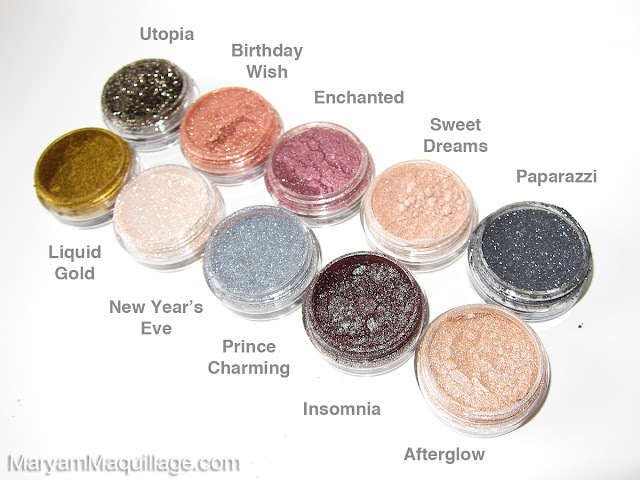 Optional: add glitter to the cut-crease portion (MUG pigment Utopia). 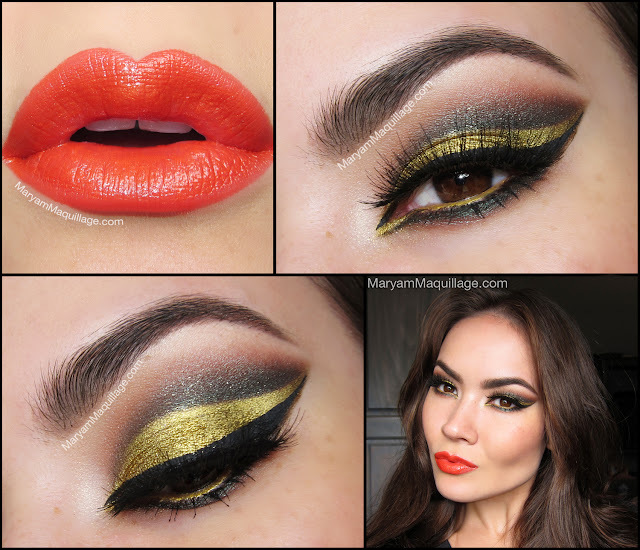 Finish the look with black liner and extend both inner and outer wings. Add spiky false lashes and mascara to complete the look. Wow love this! Absolutely stunning! Awesome look!!! Thank you so much!!! Oh my goodness! This is definitely what I need! I really don’t know how to fix or set my makeup during special occasions. Thanks for posting this cool tips and styles on you blog post. You are an answer to my prayers. I love it! Hope to see more unique makeovers! God Bless! 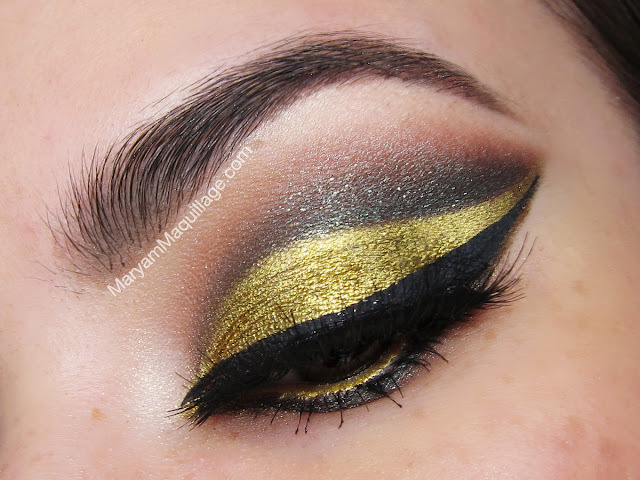 LOVE that gold shadow!! 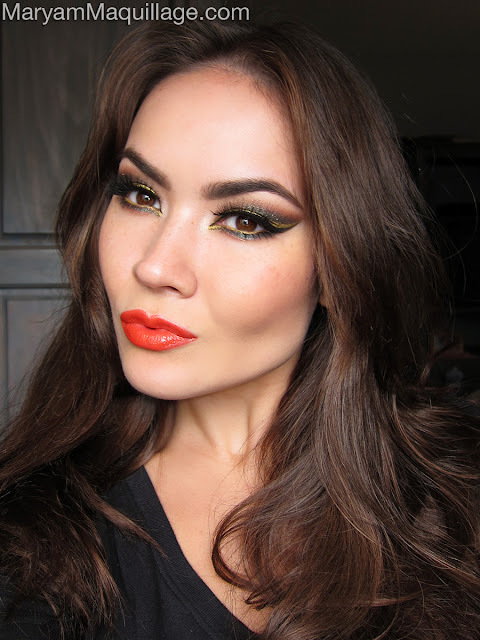 I would never have thought to pair orange lips with something like this but it looks awesome, very on-trend!